Biologists with the S.C. Department of Natural Resources are reporting increased black bear activity throughout the state, and they urge people to use common sense when encountering these fascinating animals. The warm weather has black bears on the move, and with few berries yet ripe, they are hungry and looking for food. While people may be excited about seeing a bear, biologists urge them to remember that bears are wild animals and should be respected. 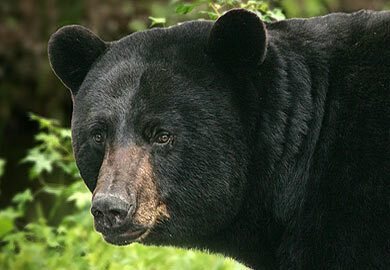 Black bears are usually shy, evasive and non-aggressive toward people. Neither a human fatality nor even an attack have been attributed to a black bear in South Carolina. Bears have been spotted in 45 of 46 counties (Bamberg County has no confirmed sightings). If you see a bear and would like to report a sighting, please use the web-based reporting form, developed by the S.C. Department of Natural Resources (DNR). Sightings are recorded and used to aid in black bear management. The mere presence of a black bear does not necessarily represent a problem. Most bears are just passing through, but if there is an easy meal to be found, they will take advantage of it. The key to dealing with wandering bears is not giving them a reason to hang around. Removing any food source that would attract bears will greatly reduce any bear issues in residential areas. * No feeding: A bear that becomes accustomed to having food provided is an accident waiting to happen; don’t feed a bear the first time and it will likely leave the area soon. * No garbage: Keep garbage in tightly shut or bear-proof trash cans; garbage left in the open, in an open dumpster, or in the back of a truck is an open invitation for a bear. * Pet food storage: Store pet food properly if kept outside; put pet food in airtight storage containers and don’t leave leftover food out in the open. * Clean grills: Keep charcoal and gas grills covered and clean to keep food odors from attracting bears. * Bird feed and feeders: If a bear starts getting into your bird feeders—and they will if given the chance—take the feeders down and put them away for a while; the bear will move on quickly. Or install the feeder on a rope or cable so it can be raised and lowered. * Beehives: If you’re going to have beehives in bear territory, protect your investment with an electric, bear-proof fence.